Murder at the Mütter® (it’s a registered trademark) is an event that we have hosted since 2011. Every year the “Murder team” create a new scenario, collaborating with scientists to include tasks that involve real crime scene and forensic analysis. Tickets to the event are very limited and sell out in minutes, so every year we have discussions about how to expand the reach and impact of the event and all the work that goes into it. We’ve talked about video, web content, digital exhibits etc… but like many nonprofits, struggle to get the time and resources to make something happen. Our biggest social media following is on Instagram. On social (cross-platform) we share a mix of events promotion and collections-based content. Murder doesn’t usually get featured much on social because it sells so quickly. I’ve hesitated to share it much before because I don’t want to alienate people who couldn’t get tickets, unless the content meant something. I’m really conscious of each piece of social media needing to tell a story in itself without needing additional context and that’s hard to do with this event. I thought that Instagram Stories could be a good way to share what happens at the event because it’s an event with multiple elements and a narrative. We’ve done Facebook Live for panel discussions with mixed results, but this event is so fragmented, it wouldn’t work so well. We post a few times a week on Instagram and Facebook, and because the are so many parts to this event, Insta Stories seemed like a good avenue to try. 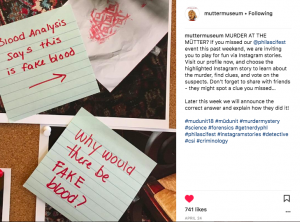 Murder at the Mütter 2018 took place on Sunday afternoon (April 22), and I didn’t actually attend (I have a 5 month old), but a couple of my coworkers texted photos and videos to me in real-time. I already had some of the evidence – the police notes, fake Facebook posts, etc. Other than that I didn’t know anything about the story, I was kind of making it up just from the content I was getting. By evening I thought: Why not take this as far as we can…? So I threw up a “to be continued…” and left it until the morning. Monday I asked for the actual scenario (it’s a confidential document!) and all the event photos I could get my hands on, and continued the story more strategically, trying to incorporate as many clues as possible. I had to take notes and figure out how evidence connected to the crime. The poll feature on Stories was a perfect interactive element because it fully involves people who couldn’t attend, and that’s what I always want from doing social media at events.